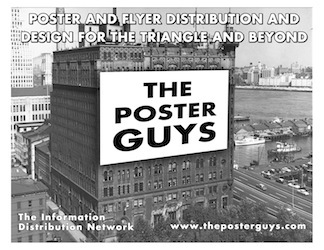 "Bring your posters or flyers to our drop-off point at 102 Old Pittsboro Rd in Carrborro. Its easy to find. If you are coming from Chapel Hill take the Main Street fork(left) after you cross the tracks, then turn left at the traffic light at Wendy's and turn right on Old Pittsboro Rd which is the second street after Wendy's. It's the 2nd house on the right with a very big tree in the front yard- we share a driveway with the first house. Just leave them on the front porch and we will get them. If you are coming from the Bi-pass or Highway 54 there are two entrances to Old Pittsboro Rd, one at the bottom of the hill and one at the top. You will need to go 3/4ths of the way around the traffic circle. If you enter from the bottom we are the 2nd to last house on the left. If you enter from the top we are the 2nd house on the right. We start Chapel Hill on Sunday so you need to have your posters there by Saturday night. We can also get them on Monday but it means more work for us and going back to the places we went on Sunday which often are full by Monday. We do Durham on Wednesday and Raleigh on Thursday. We also pick up on Wednesday in Durham at Regulator Books on 9th Street. Make sure your posters are there by noon. We pick up in Raleigh at Nice Price Books at 3106 Hillsborough St Raleigh on Thursday at noon. We do Greensboro every month if we have posters or by special request. 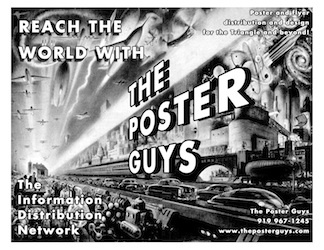 The cost is $50 per 100 posters and we do 100 posters in each town. So if you just want Chapel Hill done leave 100 posters and a check for $50. If you want to do Chapel Hill, Durham and Raleigh we would need 300 posters and $150. 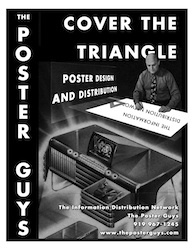 (If you want us to include North Carolina Central and Durham Tech add 100 posters and $50) Greensboro costs $75 per 100. You can write checks to The Poster Guys. If you are an University organization or a business or non-profit that needs to submit invoices for payment leave a billing address with the posters. Struggling Non-profits and Musicians pay half price. There is also a paypal thingy on the bottom of the front page that you can use. In Chapel Hill we cover the public bulletin boards at UNC campus, hospital and medical center, the poster kiosks on Franklin and Rosemary Streets, any shops, restaurants and cafes with bulletin boards, Carrboro, Weaverstreet Market, Farmers Market, Elmos, Art Center, Century Center, Whole Foods, Weaver St Market in Southern Village, and a few other places. We also include Chatham Market in Pittsboro and several locations in Hillsborough including Weaver Street Market. In Durham we cover Duke University east and west campus, Medical Center, 9th Street, Broad Street, Whole Foods, and Brightleaf Square. We also do NC Central and Durham Tech by special request. In Raleigh we cover NC State campus, Meredith Student Union, Hillsborough Street, Whole Foods on Wade Ave and some cafes and restaurant bulletin boards downtown and in the Glenwood area. Raleigh customers who leave their posters at Nice Price Books on Hillsborough Street next to Cuppa Joes need to let us know that you have left them there for us. 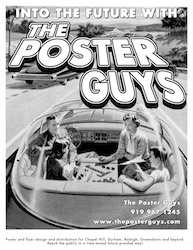 Chapel Hill and Carrboro customers can also have their posters printed at The Ink Spot on Main Street in Carrboro and we can pick them up there at no extra charge. But they need to be there by Friday because they close over the weekend. You can call them for rates at 919 933 0005. Its the best place to get copies because they can usually do them right away because they are never busy and you can always find parking there for free. The other option is Kinkos/Fed Ex on Franklin Street and we can pick them up there at no charge. Try to have them ready by Sunday morning when we go out early and do Franklin Street. We can also do some special jobs like menu distribution to offices and faculty and grad student mailboxes on request. There is also a paypal thingy on the bottom of the front page that you can use.